So now you've created an amazing springtime centerpiece, what if you want to take your theme further and embrace an entire spring table decor idea? Here are some great ideas. Decorating a table creatively in Spring, is probably easier than at any other time of year. 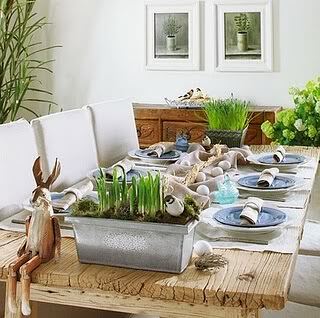 Just one look around you will open up a world of natural materials to use in your spring table decorations. The fresh green shoots are starting to appear, and the first signs of spring are here bring us wonderful tulips, crocuses, hyacinths and daffodils. If you don't have any of these in your garden, they will become less expensive when the season gets going. A simple bunch tied with some raffia, makes a wonderful centerpiece on its own. One particularly easy way of creatively decorating a table, is to echo the flowers you have used in your centerpiece, onto each place setting. Either place it across the plate, tie a coordinating ribbon around it, or use the petals as a stand for a name place card. 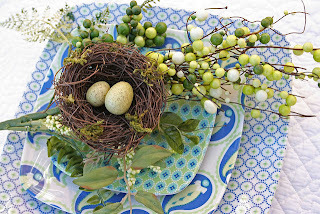 New life is the theme of spring, and incorporating a mini nest either as a centerpiece or mini place setting makes a wonderfully creative touch - make the eggs chocolate ones to enthrall little guests, or make your own from polymer clay. Use some branches and twigs in your table centerpiece, to echo the theme across the table. A piece of driftwood, or small plank of wood set down the center of the table, makes for a particularly unique table decoration. You are then free to add candles in holders, or shot glasses with flowers along it. Make your springtime creative table decor come alive with some zingy bright spring colors, and fun springtime elements. Start out with a white or yellow table cloth as your base, and use the brightest crockery you have. The spring table centerpiece on this one can be as creative as you dare. Use a simple flowerpot of greenery (even just grass or watercress), and set a nest in the centre. Lay it onto a square of green felt and then build up your fun image - a fairy toadstool house ornament, or ducklings and chicks to run riot across the rest of the table too. Why not add a runner of blue fabric down the center of the table and ruche it up to give a wavy effect - room for ducklings to swim in. Edge with flowers or smaller pots of grass, and don't forget to include some fluffy lambs or crafted Easter bunnies. As for floral decorations in this design, large daisies or pink tulips work well, as do daffodils. Make small toadstools from polymer clay (or use real mushrooms on the day), with a small slit cut into the top, to allow for a dinner table place setting name card. Remember the table decor's color theme should be bright, but not overpowering - make sure there is plenty of green to balance out the yellows and pinks that are likely to feature. 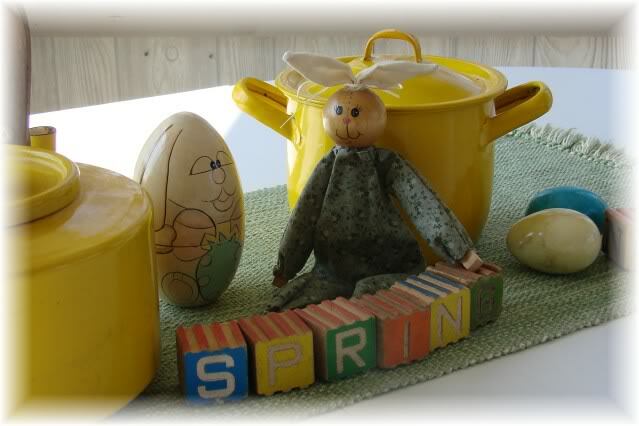 A prominent feature in any creative spring table decor will eventually be that of Easter. Any of the above ideas will work well for an Easter theme with just a few tweaks. 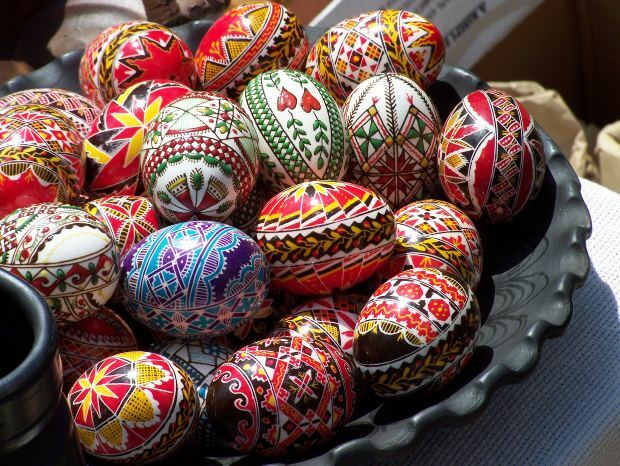 Use a basket or large shallow dish to display a pile of painted eggs. Leave them plain or decorate with any pattern you wish. You could even use egg shaped candles to match your color choices. 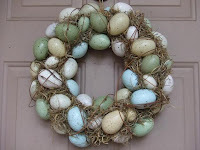 Create a table wreath made from painted eggs, or even plastic eggs (plastic eggs are available from many pet stores as they are used as encouragement for chickens to lay!). Use wire to push through the eggs to attach them to each other, and hot glue gun certain places for added support. Then wrap around leather strips, or ribbon to keep it all in place and add further decoration. When you are in the pet store, why not pick up some plastic aquarium plants to use as grass and foliage around your display, or utilize mini flower pots and dress each with grasses or herbs from the garden. To show respect for this religious holiday, incorporate some crosses by either using washed popsicle sticks, or wide dried grasses. Creative table decorating in spring just means using the natural materials around us to embrace the feeling of the season, and having a little fun with finishing touches along the way.